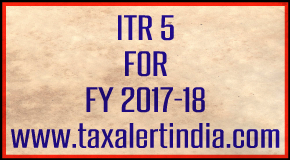 CBDT has notified income tax return form ITR-5 for the financial year 2017-18. CBDT already issued ITR1,ITR2,ITR3 and ITR4S(SUGAM) form for financial year 2017-18 which also can be downloaded from below link. Initially CBDT only issued ITR5 in java platform whereas ITR 1, ITR2, ITR3 and ITR 4S are available both excel and java format.